Indiana State University police have a new lead in the search for missing student Gerald Smith. A man fitting Smith's description was seen between 1:30 and 1:45 a.m. Friday (May 1) near Second and Canal streets, west of the ISU campus. A witness has told police he saw a man wearing a red Hawaiian shirt talking with a man and woman in a gold Toyota Camry or similar vehicle. The conversation lasted two to four minutes before the man in the red shirt and the occupants of the car went their separate ways. Police are asking anyone involved in that conversation or who may know anything about it to call ISU Public Safety at 812-237-5555 or Wabash Valley Crimestoppers at 812-238-STOP. Smith, a senior from Avon, was last seen at approximately 12:40 a.m. leaving the Ballyhoo Tavern near Ninth and Chestnut streets at the east edge of the ISU Campus. Investigators have also determined that Smith used his iPhone to access the Internet at 1:14 a.m. Friday. In another development, Indiana Department of Natural Resources conservation officers began using sonar to search the Wabash River near the ISU campus and downtown Terre Haute. 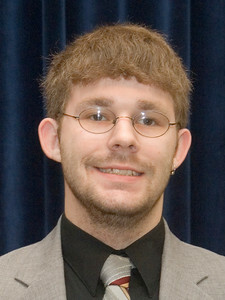 Indiana State University police have a new lead in the search for missing student Gerald Smith. A man fitting SmithÃ¢â‚¬â„¢s description was seen between 1:30 and 1:45 a.m. Friday (May 1) near Second and Canal streets, west of the ISU campus.